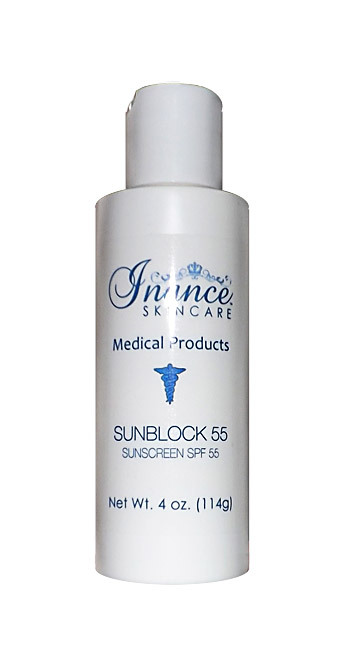 Inance Tropical Sunscreen SPF 55 combines modern nano-technology with natural Aloe and Green Tea to deliver hypoallergenic safety with greater UV blocking efficiency than other commercially available products. This sunscreen is suitable for children over 6 months of age. Limiting your sun exposure, wearing protective clothing and using sunscreens may reduce the risks of skin aging, skin cancer and other harmful effects of the sun. Broad-Spectrum protection including the wrinkle causing UVA. Green Tea contains Polyphenols and Caffeine which have been shown to have antioxidant properties that reduce skin damage. Apply in the morning and during the day as needed. Apply a dime size amount to the face and neck. Sunscreen may be applied on cleansed skin or over your moisturizer, followed by makeup. Aloe Extract A non-occlusive anti-inflammatory, antioxidant, with botanical qualities. Ingredients: Aloe Barbadensis Extract, Green Tea Extract, Cetyl Dimethicone, Cyclomethicone, Deionized Water, Dimethicone Copolyol, DMDM Hydantoin, Hydroginated Castor Oil, Iodopropynyl Butylcarbamate, Isopropyl Palmitate, Microcrystalline Wax, Melanin, Mineral Oil, Octyl Salicylate, Octyl Stearate, Polyglyceryl-7 Oleate, Retinyl Palmitate (Vitamin A), Silica, Sodium Chloride, Sunflower Oil, Tocopheryl Acetate (Vitamin E).